← RP: Introducing Major Jonesing! Based on the original, and a sketch I can no longer find the URL for (particularly having the bat symbol being on a necklace and the nifty wrist thingies). I like the design of the costume but I don’t like the colors. The colors are based on the original Batgirl, as you can see in that first link. I don’t pick ’em, I just revamp ’em. I like the colors. Its like batgirl mixed with Robin. When I see green and brown together I think of Robin Hood. @Jeff:Darker red, you’re right. I think the costume would look better if you had used black and yellow, as was the 1960’s Batgirl costume. Why did you choose not to give her a cowl? Danny, this isn’t based on the 1960’s Batgirl, it’s based on the one-shot appearance of the original Batgirl, who wore the costume I put in the first link of the post. Which was green and red, with a pointy face mask instead of a cowl. I have a version with that long pointy eye mask, but it just looked unbalanced so I trimmed it off and made it just the domino mask instead. 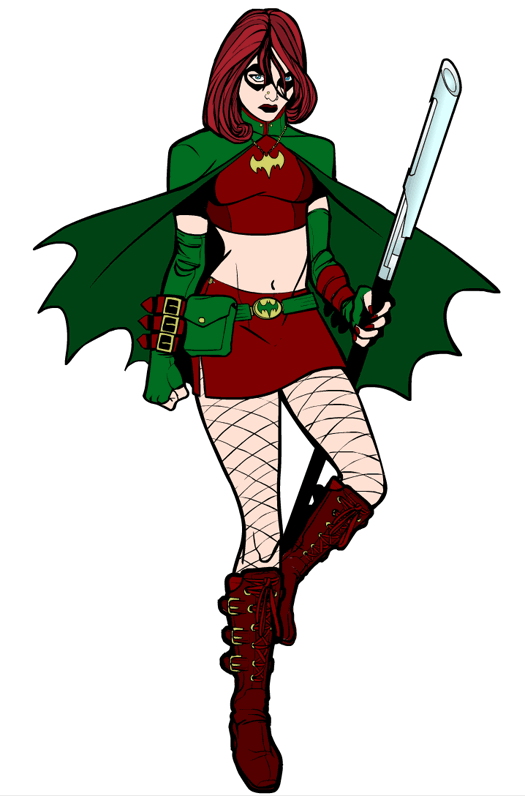 But yeah, this isn’t supposed to be the 1960’s Batgirl, or the 2000’s Batwoman, it’s the original character Betty Kane. @Jeff: I know it’s not based on the 60’s Batgirl. I’m saying that costume would look better if it had incorporated the colors from the 60’s Batgirl costume. As I said in an earlier comment, the costume design is great, so please don’t think I’m trashing your drawing. I like it, the more i look at it. I probably would have stuck with blonde hair (like the original) just to break up the red/green. Looks great!! Doggone it, you’re right Mark — the original DID have blonde hair. Shoot. That would break up the color a lot better too, you’re right, I wish I’d have caught that. Bah.